I have a couple of bears still waiting for their new home - Emma is on Bear Pile already and Lipton will be joining her as soon as I have five spare minutes. About ten days ago, I went to a pincushion class at Craft Haven. We sewed a mushroom and then made little faces/bums to go inside gumnuts and fur and then hot glue gunned everything all together. We all had a ball and here is my pin cushion - the stem has garnet inside to sharpen your needles and the top is a pincushion. We have a cute little ferret called Nog. As Crash (our big dog with a bad leg) couldn't go outside, we had to confine Nog to running in the one room. As Crash isn't with us anymore, we put the other dogs outside and let Nog have the run of the whole house. Both Nog and Angus enjoyed it !!! 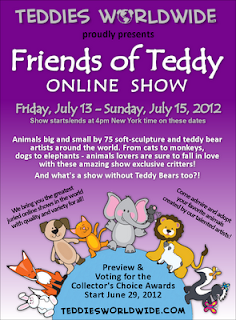 Last but not least, I have been accepted into the Friends of Teddy On Line Show to be held between the 13th and 15th of July. 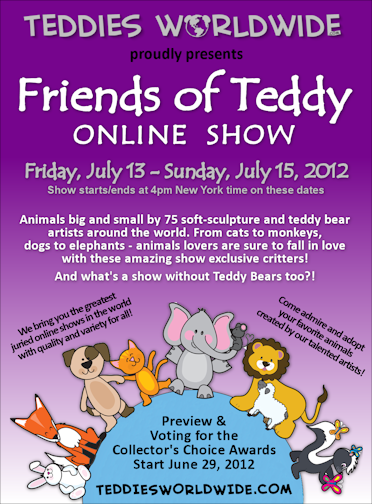 This show will feature the Teddy Bears "Friends " ie: dogs,cats, rabbits, dragons and lions :) and also some bears as well. Back again soon ....... no really ! !